Cactus Club (web site) is a chain of really fun, trendy, and dynamic restaurants with outstanding food. 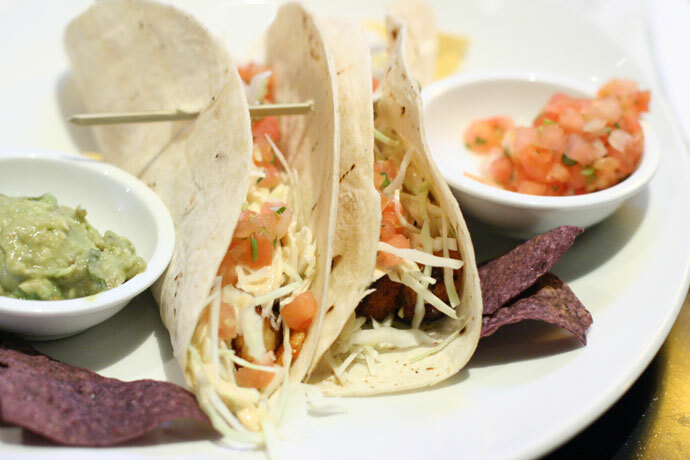 Pictured below are the Soft Fish Tacos (around $11) which were delicious! The restaurant is also known for their steaks, rice bowls, appetizers and specialty drinks. Cactus Club’s West Vancouver location (in Park Royal Village, at 855 Main Street, West Vancouver, BC, Canada, map, phone: 604-922-1707) is only about a 20 minute drive from downtown Vancouver (depending on the traffic on the Lions Gate Bridge). If you’re looking for a great way to spend New Years Eve 2007, the West Vancouver location is putting on a special evening of live jazz by the Geoff Peters Trio. Be sure to give them a call for more info. More photos: View Part 1, Part 2. 14,072 views. This entry was posted on Saturday, December 15th, 2007 at 5:26 pm	and is filed under Affordable, Bar, Burgers, Casual, Chain Restaurants, Chicken, Creative Dishes, Entertainment, Favorites, Food Photos, Fun atmosphere, Fusion, Hamburgers, Healthy Food, Jazz, Large Groups, Live Music, Lively, Lunch, Modern Decor, Music, New Years 2007, Open Late, Pasta, Patio, People Watching, Reasonably Priced, Restaurant, Seafood, Small Plates, Sports Bar, Steaks, Take Out, Tourist Attraction, Trendy, Upscale, Vancouver, Vancouver Restaurants, West Vancouver. You can follow any responses to this entry through the RSS 2.0 feed. You can leave a response, or trackback from your own site.